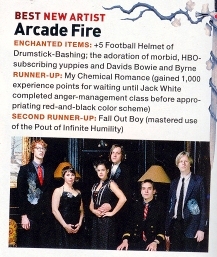 In the March issue of Spin magazine, the 2005 reader's poll results were published. 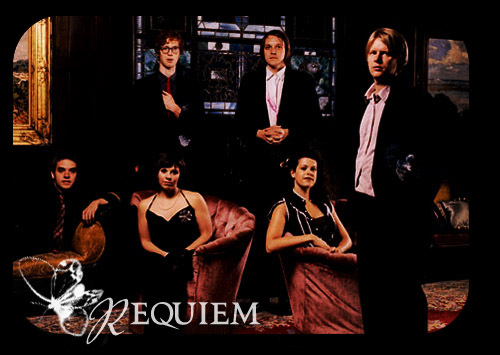 Arcade Fire were voted the Best New Artist. Here are some scans of the issue in question along with a transcript of the interview with Win and Regine on their win. "Well, hello, fair Sir Crow! Lovely day! How you dazzle my eyes! I'll know you're the phoenix reborn in these woods!" He opened his bif beak and promptly dropped the goods. Lives at the cost of those who give him credit. That lesson's worth a cheese, no doubt, so don't forget it!" Swore, a bit late, never again to be taken in. MORAL: When you cover one of David Bowie's songs, let him cover one of yours, as well. Enchanted Items: +5 Football Helmet of Drumstick-Bashing; the adoration of morbid, HBO-subscribing yuppies and Davids Bowie and Byrne.